We are a voluntary charity based in West Lothian. 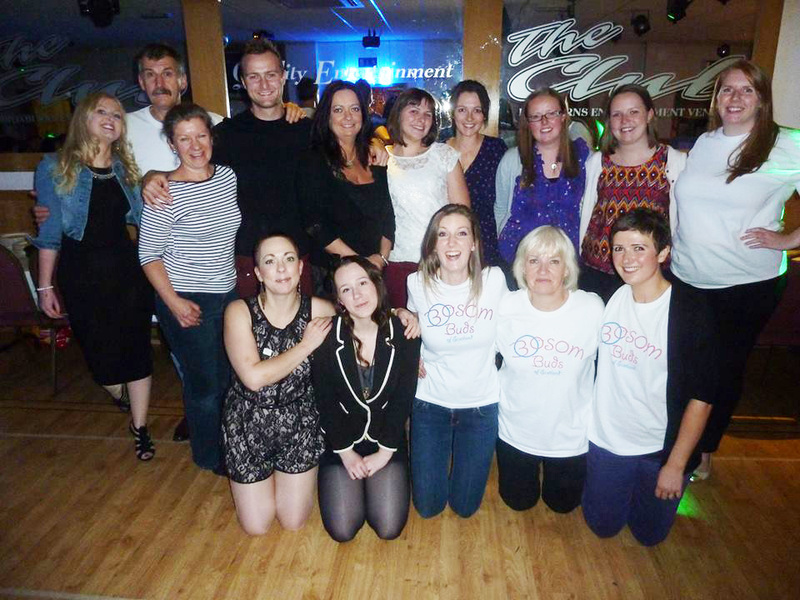 Formed in 2009 by a group of friends as a result of two members being affected by tumours, we were inspired to help by raising money and awareness. We donate funds to St John’s Oncology Unit and Breakthrough. We also supply real hair wigs, fund eyebrow tattooing, provide mastectomy bras, arrange pamper days, provide post-treatment exercise classes & personal trainer instruction, meditation courses and yoga classes. We work with all patients, regardless of age, race, cancer type / diagnosis, etc. We use WordPress for all our website, which includes the blogging facility. Hi,I met some of your lovely ladies on Saturday at our wish Xmas cabaret 🙂 Mags mentioned an abseil to raise funds….do you have any more details yet? Having had relatives and friends affected by cancer I would be interested in taking part in edinburgh marathon 2014, and was wondering what your sponsership amount would be to run on behalf of your charity since its for such a good cause. Shannon, I’ve sent you an e-mail. Sorry for not responding sooner. Trish. Hi there, just letting you know I’m having a race night to raise funds for you in August at Uphall golf club in memory if my cousin Nicola Wilson who died on 17 march of this year. Hi Davie, I have replied to your personal e-mail about this. I am thrilled that you have sold so many tickets that you do not require us to advertise this event for you. I hope it all goes well on the day. Thanks so much for your kindness and help in fundraising. Nicola & I had a lovely time chatting together at our Pamper day at Harburn House. She looked stunning on the day and was very happy to be there, and she was great company too. Do you have collection tins. We would like to put one in our office for clients to put their 5p in for carrier bags. We probably gave away 2000 bags last year. I know that this will drop as people become bag aware but still it should add up. Hi Roddy, Sorry for the delay in responding to you. I believe that Mags has already spoken to Jo regarding this now – hopefully you now have a collection box! Thanks for your support. Hi there, my name is Avril Stewart. I am 40, married and have 2 children (9 and 8). I was diagnosed with breast cancer in November of last year. I had a lumpectomy and a further operation in January to remove more cells. Everything went very well and I’m now going into my 3rd chemo session this week. I will also require 5 weeks of radiotherapy afterwards. I just wanted to thank Bodom Buds so much for funding my real hair wig which has made a huge difference! It makes me feel normal! And means that things have not changed drastically for my children! You do a fantastic job and really make a big difference to the people that you help! Thank you once again, it is much appreciated! Very big thankyou to BB for an excellent day out today at Morton Clays(10/06/2017), really enjoyable and I am sure all the other guys did as well. .